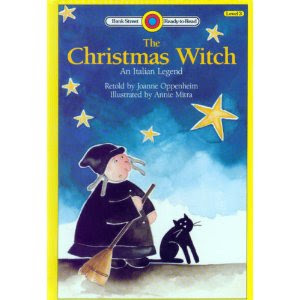 In our study of Christmas legends, we came across the Italian legend of Befana. Her story takes place in January, connected to the Epiphany, so it's a little early for it yet. But, it's a very good cautionary tale for our busy Christmas season. ...but like most of the Christmas books I have on hold on at the library, they haven't come in yet. So, let me share my version of the story with you instead. Befana was an old, and some would say grouchy, woman living in a small village, two thousand years ago. She was sad, because in her youth she had lost both her husband, and her only child. 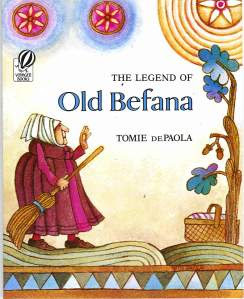 But, life goes on, and so did Befana. She busied herself with baking, and sweeping, and keeping house in general. "I'm much to busy for guests today," as she swept them from her porch along with the bits of dust, and flour from the floor. As time passed her youth faded, and her grief weighed her down, stooping her back, and wrinkling her face into a permanent frown. Gradually, neighbors quit knocking at the door, no matter how delicious the smells coming from her kitchen. And, the village children, who had come to think of her as a witch, stopped playing in street outside her house. That was just fine with Befana, she had work to do, and didn't need the interruptions. Besides which, the laughter of the children, caused her pain. She preferred the silence. After many years of silence, she was surprised then, late one evening to hear a knock at the door. She answered it, preparing to shoo away however was there, but paused when she saw three foreign men, richly dressed, in beautiful robes, standing on her porch. They explained they were astronomers from the east. They were following a star, they were certain would lead them the Christ Child - the Promised One. They had already traveled a long way, and still had far to go, but they were tired, and thirsty, and wondered if she might give them a drink of water, and let them rest a while. Stunned, Befana invited them in. She gave them water, and bread, fresh from the oven. As they ate, they talked about the Child they hoped to find. He would be a King, the Son of God, the Redeemer promised in the ancient texts. Befana listened impatiently, hoping they would leave soon, so she could do the dishes, and sweep up the dust they had tracked in, before bedtime. She got her wish. The men didn't stay long. They were in a hurry to follow the star. They didn't want to miss the Child. But, before they left, they invited her to join them, to see Him too. "I couldn't possibly go," she said quickly, showing them the door. "I could never leave with the dishes undone, and the floor unswept. And, tomorrow's bread is rising in the kitchen. Who will bake it, if I'm gone?" The men left, and Befana busied herself cleaning up. She washed the dishes, and started to sweep up the sand. It glinted in the candlelight, and she thought of the star, and the Child. Suddenly, she wondered what she'd been thinking. Her lonely heart melted, and she wanted nothing more than to welcome the Wondrous Baby to the world. With her broom still in hand, she quickly loaded a sack with baked goods for her journey. Then, almost as an afterthought, she pulled an old trunk out from under her bed. In it were the toys her own child had loved. She would give them to the Baby. She hastily dropped the toys into her sack, wrapped herself in a shawl, and headed out after the men. They were nowhere in sight. She looked up, but not being an astronomer, she wasn't sure which star the men were following. Finally, she started walking, the men had come from the east, so they must be heading west. Her walk turned into a run, but still she could not find the men. Some say she ran so fast, she made a wind, and the wind lifted her, broom and all, into the night sky. Yet, even from the air, she could not see the men. How would she find the Child without them? She was discouraged, but determined, and all the energy she had put into sweeping, and baking for all of those years, she now put into her search. She would find the Child if she had to look for Him from house to house. Some say she's still looking today. And, that every year on the 5th night of January, she makes another search of homes across the land, leaving gifts for the children living in them, in the hope, that one of them might be the One. At this busy time of year, with so much baking, and cleaning, and running to be done, aren't we often like Befana...too busy for Christmas? Of course, I thought I'd be cheeky, and clever. I wanted to bake the children some kind of Italian Christmas treat to go along with the story. But, also to go along with the story, I didn't want to be at it all day. So, after a quick search, I found a bread machine recipe for Panettone (a fruitcake-ish Milanese sweet bread). It was a little plain by comparison to the traditional recipes, so I fancied it up into the recipe below. 1/2 cup golden raisins, and craisins, or any mixture of dried fruit. Add the ingredients to the bread machine in the order they are listed, saving out the dried fruit to add at the beep for the final kneading cycle. Select light crust for white, or sweet bread, and start the machine. This should free you up quite a bit of time for showing hospitality to neighbors, or playing with your children. Unless, like me, you dump the bag of sugar on the floor, while adding ingredients to the bread machine. Then, you will spend the rest of the day sweeping, and mopping, and wiping down counters, enough to rival Befana. Don't worry if this happens, the bread will still taste good. And, you can serve it with the bread machine warmed raisins, and craisins. If everyone pops a few in their mouths with each bite of bread, it ought to taste just about right. Oh, that story is so sad. Thanks for the reminder to slow down this season and enjoy it for what it really is supposed to be. That bread sounds good. We were given a bread machine for Christmas last year and it is still in the box. I should take it out and use it. Maybe I'll start with this! What a sad story, but I so need to find it for next year and maybe we'll add in Italy to our study of countries. While it is a sad story, it is so true to the way so many of us live. We get so caught up with the hustle and bustle of the Christmas season we forget the important things, family, friends, and peace to all. Thank you for the reminder. How interesting - the story like this exists in Russian folklore, and I've seen it here as Baboushka and The Three Kings. I didn't know that Betana is the same story. I love how normal you are!!! The fact that the bread makers beeped and you missed adding the fruit!! Love it!! The ideas and information that you have here (and other posts lately) are totally awesome and I'm thankful for all your advice and information!! Hope this week is fabulous, i look forward to reading more of your stories! Sharnee - Amazon ships to Australia, according to their website, anyway. They have a spot at the bottom of their main page where you can check shipping rates to see if it's worth while. Or, you might try speaking to your local book store, to see if they would order books in for you without charging you shipping.